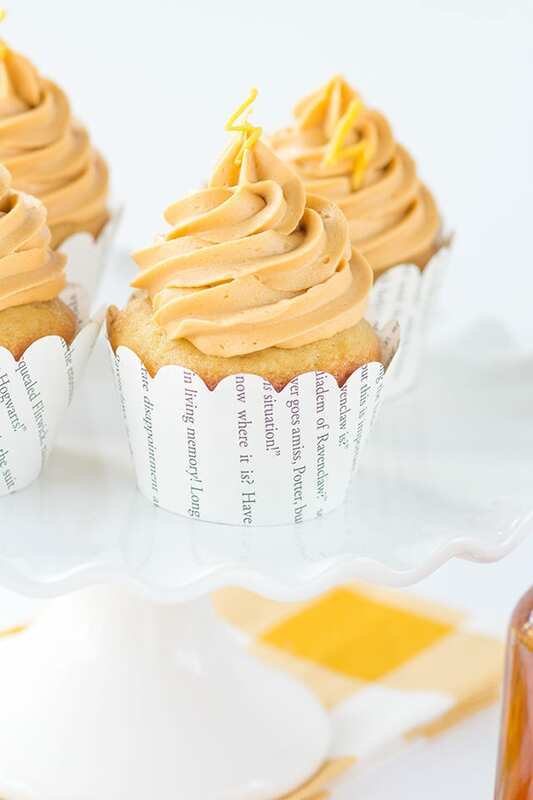 Harry Potter’s Butterbeer Cupcakes! 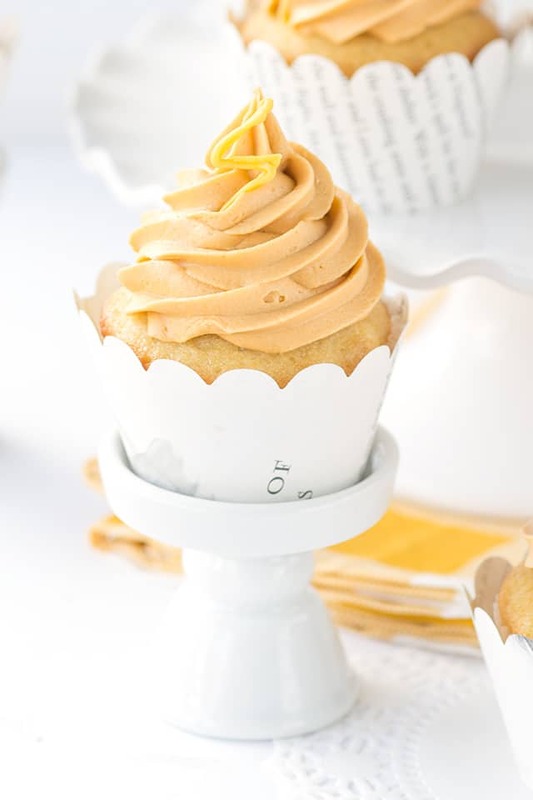 They’re a vanilla cream soda cupcakes with a butterscotch cream soda frosting. 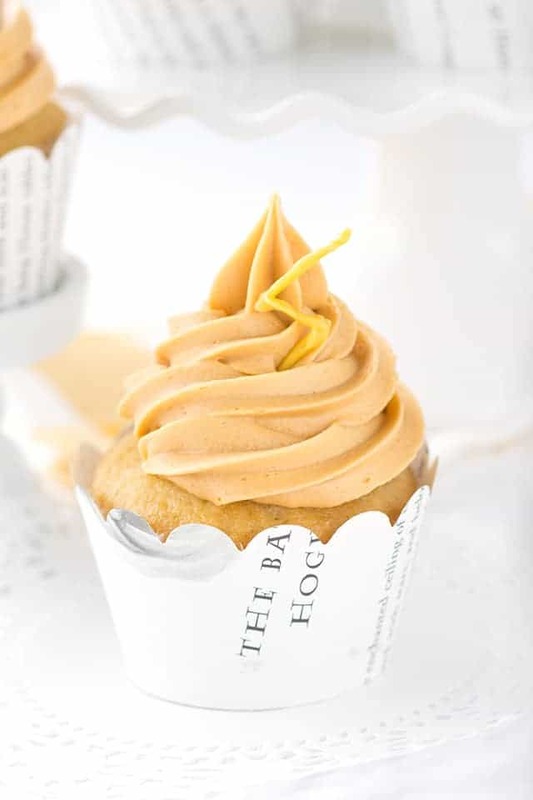 It’s the perfect cupcake for any Harry Potter fan! 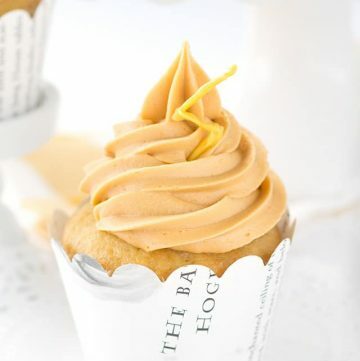 Butterbeer cupcakes. Butterbeer, folks. I freaking love this stuff. I put together some cream soda and butterscotch and went to town on some cupcake making. When your son says,”MAMA, this frosting is AHHHMAZING! !” you know you did something right. My little guy is a natural charmer, but he never hands out those kinds of comments unless they are earned. You know 5-year-olds can be brutally honest. Have you been over to see my Harry Potter’s butterbeer fudge? These cupcakes are equally amazing and even prettier if I do say so myself. I’m pretty proud of my butterbeer frosting. It has butterscotch chips AND cream soda. It has the most amazing whipped consistency. It holds a nice shape when being piped. It is just perfection. Have you seen the preview for Fantastic Beasts? If I didn’t just go to see a movie with the hubby, I would be sitting in one of those big red comfy recliners watching it this weekend. Unfortunately, going to the movies is expensive and finding a babysitter that I approve of is hard. You better bet your buns that I’ll be first in line to get it at the Red Box though. I’m all about the Red Box life. If you’re wondering what movie I did get to go see, it was Dr. Strange. It was long but good. Lucian stayed with a good friend of mine and my husband and I went on a real dinner and a movie date for the first time since Lucian was born. That was one of my birthday presents and it felt great. Then I came home to find that Lucian painted the most amazing picture for me for my birthday. That brought on the waterworks. I don’t know why but I was just so happy that I couldn’t help but cry. 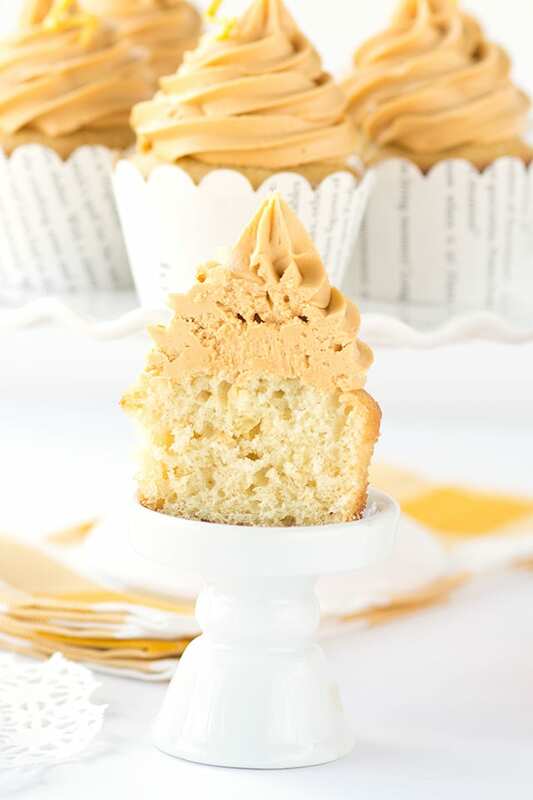 Moving on, let’s talk about the cake in this butterbeer cupcakes recipe. It is the perfect cake to load up with liquids. I added 3/4 cup of room temperature cream soda and 1/2 cup of buttermilk to it and it came out perfectly. I initially thought that all of the sugar in the soda mixed with the sugar that I added would make the cake fall, but I was wrong. I adapted this recipe from my peppermint oreo crunch cake which you should also check out. It’s a pretty amazing Christmas cake. You can find these awesome cupcake wrappers on Etsy. I went with Caitlin’s Creations and searched for Harry Potter cupcake liners. They came from actual Harry Potter books which I think is pretty neat. I’m pretty stoked about my harry potter cupcakes. I love the tiny lightning bolts I made with yellow candy melts. I made probably a hundred of them because I wanted the ones I used to be perfect. You can also grab some new large lightning bolt cupcake toppers or lightning bolt and star sprinkles. You’ll need to pick out the star sprinkles and save them for a later date. Who doesn’t want extra star sprinkles to toss on some frosting at some point or another anyway? Preheat oven to 325 degrees. Line cupcake tin with paper liners. Add in the vanilla bean paste and each egg separately and mix until incorporated. In a separate bowl, add in the flour, baking powder, baking soda, and salt. Stir to combine. In a measuring cup, measure out the cream soda and buttermilk. I added mine together. Alternately add the flour and cream soda/buttermilk mixture always starting and ending with the flour. I did 3 parts flour and 2 parts buttermilk. Scrape down the sides and mix to combine. Place in the oven and bake for 23 - 26 minutes or until done. Place a skewer into the center of the cupcake, if it comes out clean or with moist crumbs it's done. If it still has batter, let it bake a while longer and test again. Mine were done at 23 minutes. Remove from the cupcake tin and let cool completely. In a medium microwave-safe bowl, add in butterscotch chips and heavy cream. Microwave for 30 seconds and stir. Repeat 2 additional times or until the mixture is completely smooth. It will take a minute or two of stirring for the heavy cream and butterscotch chips to incorporate. Add in 1 tablespoon of cream soda and stir until thoroughly incorporated. Add in the 2 remaining tablespoons of cream soda and stir until that's thoroughly incorporated. Cover with plastic wrap and place in the fridge to cool until thickened. It should take about 45 minutes. Once the ganache has thickened, remove it from the fridge. If it's rock solid, it needs to sit out to take the chill off and loosen up or you'll burn out your hand mixer trying to mix it. Mine was thick but still pourable. Add in the powdered sugar and mix on low until the powdered sugar is almost incorporated. Turn the hand mixer on high and mix for an additional 2 - 3 minutes until the frosting is whipped. Place frosting in a piping back with a 1M tip. Pipe swirls on top of the cooled cupcakes. Heat the yellow and milk chocolate candy melts together. Start with 45 seconds and stir. Add another 30 seconds and stir again. If it's still not smooth, do one more round of 30 seconds and stir until smooth. Pour in a sandwich bag and cut a tiny hole in one of the corners. Pipe lightning bolts on a large piece of wax paper. Let the candy melt lightning bolts harden and stick in the frosting. I would love to dive right into these delicious looking cupcakes! So cute! And such a fun HP theme to work on! Miranda, those cupcakes look absolutely scrumptious! And that frosting…yum! Just pass a few of those my way, please! Thanks for linkin’ up with What’s Cookin’ Wednesday!